Bhaya, The Cruise Company who operate cruise itineraries of the beautiful Halong Bay – Vietnam, recently completed a successful sales mission of Australia updating supporters from the MICE, Retail, Wholesale and Tour Operator segments on the latest product and itinerary developments. The sales mission started on the 8th April in Brisbane, followed by Sydney before finishing the week in Melbourne. 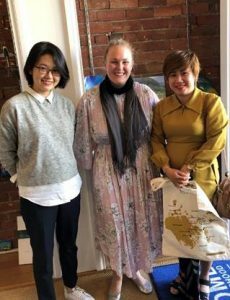 Ms Zoey and Ms Chi held meetings and product updates, highlighting the benefits of consumers selecting the vessels, including unique itinerary routes and the exciting news that from May 2019, they will offer an exclusive beach location accessed via a short walk through a sparkling cave system. A perfect location for individual travellers or incentive groups. Offering multiple itineraries on scheduled departures, as well as charter vessels, Bhaya Cruises are well placed to cater to the requirements of travellers from Australia and New Zealand who wish to visit the beautiful, UNESCO listed Halong Bay. Itineraries also include daily activities like kayaking, bicycle riding, cave visits and the intricacies of tea making.